If, in our marriage, we focus on what we need and negate the needs of our partner, the relationship can’t last. If we give up who we are to please our partner, we may suffocate and become frustrated, resentful and depressed. One who is self-controlled doesn’t need to lord it over another, and neither does that person need to be overpowered by another. Marriage is a balance between satisfying our self and satisfying our partner. It means maintaining an awareness of the other person and their desires, even as the other maintains an awareness of us and our wishes. It may require putting our needs aside, when necessary, to satisfy the other person’s feelings and needs. Marriage is to sincerely and respectfully discern what is best for everyone. For example, “the first duty of a chaste woman is to carry out the order of her husband.” (Cc Antya 7.106) Yet, in the Ramayana we find that when Rama ordered His wife, Sita, to remain in the kingdom until His return from banishment, Sita, renown as one of five supremely chaste women, insisted that she accompany Rama. Rama’s reasoning was that He had been banished, not Sita, and that forest life would be difficult and dangerous for her. But Sita felt that her place was to be with Rama instead of alone in Ayodhya. Had Sita automatically subordinated herself to Rama’s will, she would not have been true to herself. Similarly, had Rama insisted that Sita remain behind—for various sound reasons—He would have dishonored Sita’s desire. Sita gave up a comfortable life so that she could fulfill her need to be with Rama, and Rama gave up His vision of a safe life for Sita so that He could please her, by allowing her to come with Him. Reason and logic have been delicately tempered by needs and feelings. Both must be taken into consideration for a couple’s well being, so neither feels ignored or suppressed. 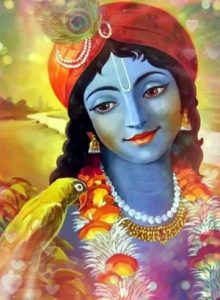 Another beautiful interplay of selflessness is when Sudama Brahmana’s wife suggested that her poverty-stricken husband visit his friend, Lord Krishna, in Dwaraka to help with their plight. Srila Prabhupada writes, “The wife was not very anxious for her personal comfort, but she felt very concerned for her husband, who was such a pious brahmana.” Sudama agreed to go to Dwaraka not because he wanted to ask Krishna for help, but because he wanted both to see the Lord and to satisfy his wife, who was so eager to satisfy him. Selfishness is closely related to the inability to hear, as our preoccupation with our self makes us deaf to another’s voice. To overcome this, we can learn to consider all matters thoughtfully with due respect to our spouse’s point of view. This honest approach, which avoids manipulation and partiality to one’s own insights, facilitates finding a better conclusion than one person could have attained alone. It is unlikely that the best possible decision will be made if one person imposes his or her will on the other. After all, our will, our deep conviction of what is undoubtedly “right” and Krishna conscious, may actually be the zeal experienced by neophyte devotees, who, in the words of Krishnadas Kaviraja Gosvami are “ expert in arguing though they have no sense of advanced devotional service.” (Cc Madhya 2.93) In other words, without being aware of it, our dearly held opinion may cloak selfishness. When differences are humbly honored and balanced, the husband and wife find the room they need for spiritual growth, both individually and as a satisfied couple. A mutual spirit of goodwill shifts their focus from themselves to the other. Each wants the best for the other and each feels the other is an ally.